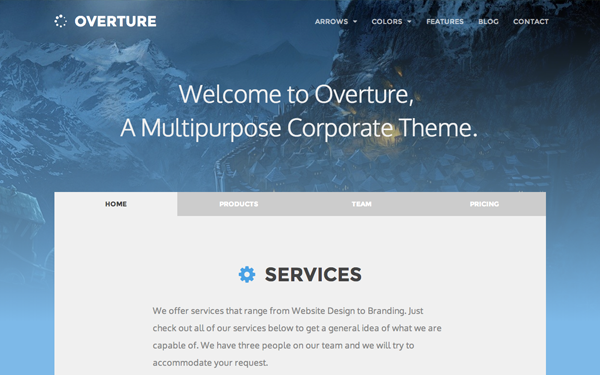 Overture is a corporate template that is perfect for individuals or businesses. This theme comes with crisp graphics and is retina ready and is responsive meaning it looks great on all devices. It has many unique sections that you can rearrange and customize so it can suit your needs exactly. It comes with 3 ready made color styles each with a unique feel. It also comes with 2 different Arrow divider styles. These are just examples and you can make your own color schemes to further customize your theme. Comes with 6 pre-made Content Sections: Portraits, Services, Contact Page, Pricing Tables, and Blog. Item Reviewed: Overture - Responsive Corporate Theme (Bootstrap 3) 9 out of 10 based on 10 ratings. 9 user reviews.